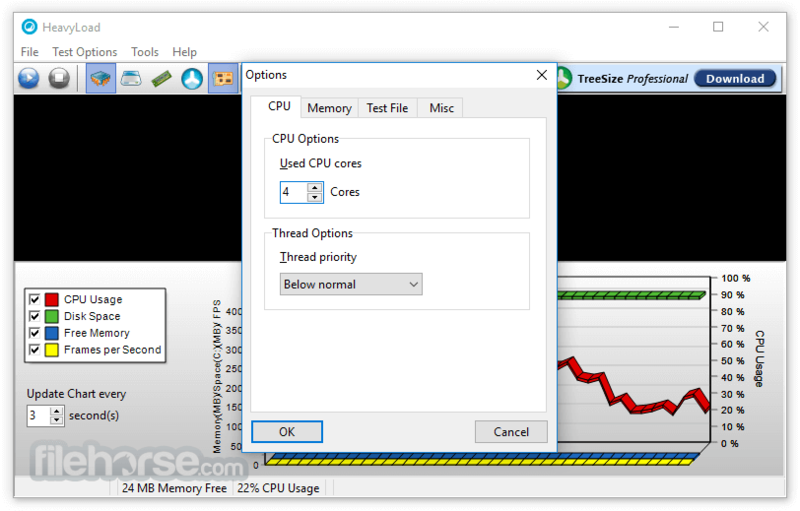 Bring your PC to its limits with the freeware stress test tool HeavyLoad 64-bit. It puts your workstation or server PC under a heavy load and lets you test whether they will still run reliably. The individual test methods employed by HeavyLoad can be customized to fit your needs. On a system featuring multiple processor cores, for example, you can select how many of the available cores shall be used or set the speed in which the test file is to be written on your hard disk. 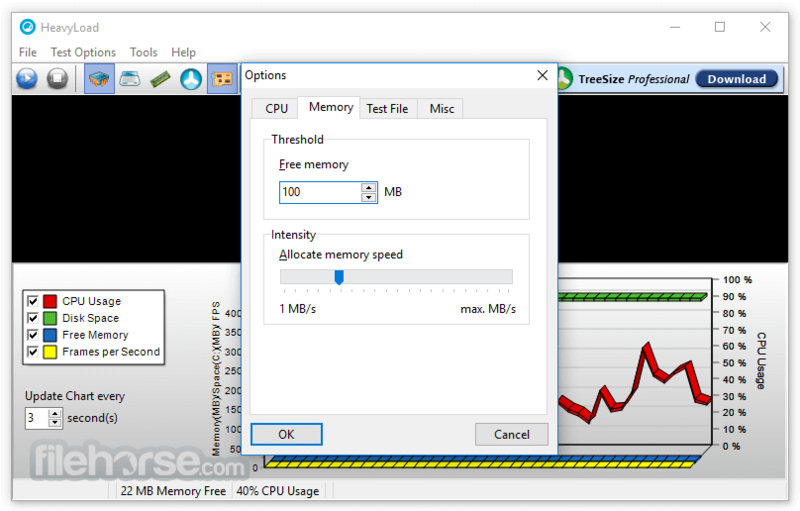 Free Stress Test Software for Your Windows PC! Enjoy. Use your processor or even a specific number of processor cores to full capacity. 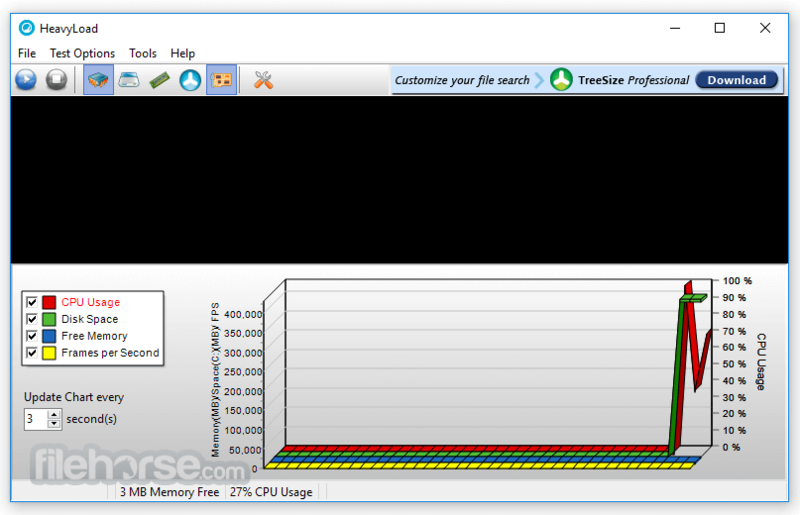 It performs complex calculations to simulate the load on your processor. Check how your system behaves when faced with dwindling disk space. It writes a test file to your hard disk with variable speed. You can define the amount of remaining disk space; once this limit is reached, It overwrites the file again and again until more disk space is freed up. You would like to test how well your computer works with scarce memory? HeavyLoad can help: it reserves memory and even allows you to define how much memory should be kept free and how fast the memory should be allocated. How much can your hard disk take? Is it reliable? With a combination of HeavyLoad and the scan function of TreeSize Free , you can find out today. It simulates a number of hits on files and folders on all local disks. How does your graphics card handle stress? With the program you can utilize your graphics card processor to capacity. HeavyLoad employs a 3D rendered graphic to simulate a high load on the GPU. Free Stress Test Software for Your Windows PC! Be mobile: Install HeavyLoad as a portable version e.g. on a USB stick and use it wherever needed!